Sir Arthur Conan Doyle about Danger! Sir Arthur Conan Doyle about Danger! 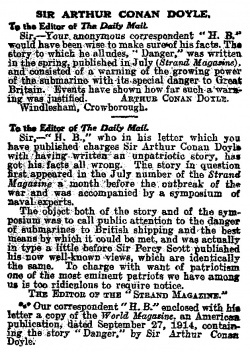 is a letter written by Arthur Conan Doyle published in the Daily Mail on 29 october 1914. Related to Arthur Conan Doyle short story : Danger! (july 1914). Sir, — Your anonymous correspondent "H.B." would have been wise to make sure of his facts. The story to which he alludes, "Danger," was written in the spring, published in July (Strand Magazine);, and consisted of a warning of the growing power of the submarine with its special danger to Great Britain. Events have shown how far such a warning was justified. This page was last edited on 7 May 2018, at 14:32.